A handful of companies, like Google and Comcast, have been working on bringing super high-speed, fiber-optic internet connections to the US, but the penetration rate is still lagging behind the rest of the world. 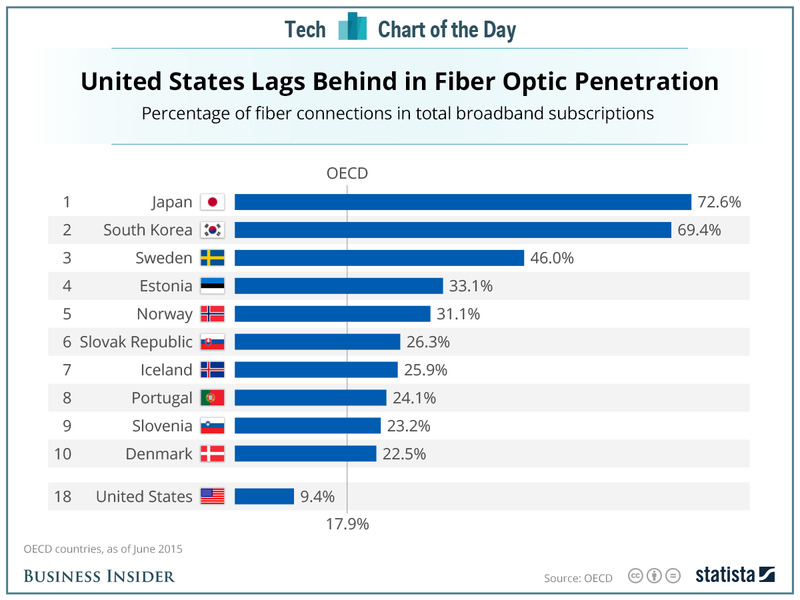 The US ranks 18th among countries in the OECD, a group of the world's largest economies, in fiber-optic penetrations rates, as this chart from Statista shows. Its 9.4% penetration rate is nearly half of the OECD average, and almost an eighth of what the top-ranked Japan has. Fiber optic connections are several times faster than the speeds you get with your standard broadband connection. It's usually fast enough to download a full two-hour movie in just a few seconds. The low fiber-optic percentage doesn't come as a big surprise, given the US has some of the slowest internet speeds in the world. But the results show the US may have a long way to go to catch up with the rest of the world in next-generation internet technology as well.